Here you can download the MSCM Program Overview PDF. Video trouble? Click here to watch this video on YouTube. To Get Started find or download my MSCM Program Overview document (download PDF on this page). The front cover should look like this. The last page is the Order Form that should look like this. Fill out the form, scan and email it back to me per the instructions on the form. 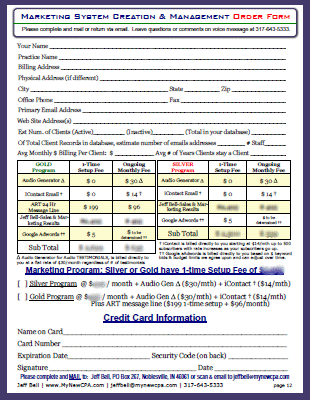 Choose the Silver Program unless we’ve specifically discussed the Gold Program. 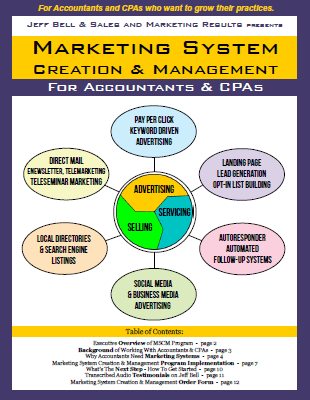 Once we process your 1-time Setup Fee I will call you to begin Phase 1 Marketing Assessment process. As always if you have any questions just email me or call me at (317) 674-3335.